A need for more infrastructure investment and grappling with technological change are two of the biggest issues facing the transit sector, according to a series of new reports. First, the American Public Transportation Association released a 17-page report on March 18 during its annual legislative conference in Washington D.C. that “identified” some $232 billion in critical public transportation investments. 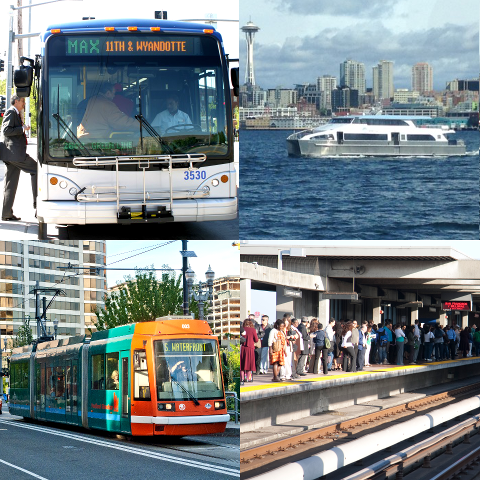 APTA analyzed the impact of that level of investment in public transportation, including the resulting long-term productivity enhancements, and found that $232 billion spent over 10 years would stimulate a 4-to-1 return of $928 billion in economic activity over the next 20 years. “Dedicated and sustained federal funding for public transportation complements the unprecedented contributions already made by states and local governments to operate and maintain these services,” Michael Terry, president and CEO of the Indianapolis Public Transportation Corp. – known as IndyGo – during March 13 testimony on Capitol Hill. Jim Tymon, executive director of the American Association of State Highway and Transportation Officials (second from left in photo at left), echoed Terry’s points during a panel discussion on March 19 at APTA’s legislative conference. “We support good transit and rail public policy, programs and funding to help move people in urban, suburban, and rural communities,” he noted. More specifically, Tymon said state DOTs support: retaining the Mass Transit Account within the Highway Trust Fund; growing the Federal Transit Administration’s Bus/Bus Facilities Program; fully funding Amtrak’s Northeast Corridor and the National Network; reauthorizing the Transit Cooperative Research Program; strongly supporting Rail Grant programs; and reauthorizing Operation Lifesaver, the safety education program for freight, transit, and intercity passenger rail. Yet rising costs and technological factors may be complicating the growth picture for transit operations to a degree, according to a series of reports compiled by Cellpoint Mobile. Those reports – based on an October 2018 survey of 2,052 U.S. consumers and 103 U.S. transit operators – found that 26 percent of U.S. transit operators say rising costs are their biggest challenge, with 23 percent of national operators and 24 percent of large transit organizations (employing from 1,000 to 10,000 workers) pointing to the implementation of mobile technology as their single biggest challenge. Cellpoint’s report series also found that “customer acquisition” is the second-most common challenge in the U.S. public transportation sector, cited by 23 percent of national, 33 percent of regional, and 17 percent of private transit operators. Finally, on the technology front, about 17 percent of transit operators responsible for payment/ticketing cite rising costs as their biggest organizational challenge, versus information technology – cited by 31 percent – and project management, cited by 29 percent.